Seriously, Philip Hammond? You’d cripple our economy for some anti-EU sabre-rattling? Philip Hammond told Welt am Sonntag: ‘We will change our model and we will come back, and be competitively engaged.’ Claptrap. [Image: Jane Barlow/PA]. Ye Gods. And this idiot is the Chancellor of the Exchequer. Philip Hammond has threatened to launch a trade war against the European Union if he doesn’t get what he wants out of Brexit. This is Tory arrogance and stupidity at its worst. We have already seen what happens whenever Theresa May mentions the possibility of leaving the single market – the Pound plummets because investors lose confidence in it. Some commentators are calling it “market correction”, which is as good a way of saying the UK economy has been over-valued as any I’ve seen. And the EU constitutes half of the UK’s export market. Jeremy Corbyn said he expected the majority of MPs in the House of Commons to be concerned about Mr Hammond’s idea, and no wonder: The UK would be crucified. People didn’t vote for Brexit to be worse-off, but that is exactly what would happen if Mr Hammond has his way. Demand for our goods would drop off, pushing people out of work. 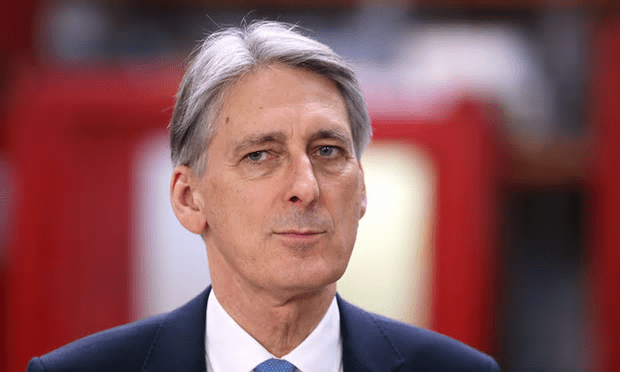 The “tax haven” status Mr Hammond wants to create means the state would not benefit – certainly not enough – from any trade that he was able to encourage. It would be the end of the UK as a major international power and the beginning of a new dark age for its citizens. Mark my words. The only way we could compete in any trade off of exports and imports in any kind of competitive market is if we employ millions more low paid migrants which will push unemployment even higher. How can this fool be Britain’s Chancellor? My guess is that it’s being used a bargaining counter. The problem is that the risk of causing an adverse outcome high and the consequences very dire indeed. Lower tax revenues, tariffs on exports to the E.U., extra duties on imports from it and the promotion of a low-wage economic model. Well basically he hasn’t rattled his sabre at all, what he said was that we would have to find a way of dealing with any attack by the eu such as attempting to prevent us trading with eu members. Wheras the original stance taken by Verhofstadt has been relaxing from the eu since the result of the referendum came in, it is still pertinent to point out trade is a two way street and if you decide to block the street the you are likely to find someone doing their utmost to unblock it. Just another pro eu bbc report, nothing to see move along. Nobody in the EU has suggested trying to block the UK from trading with anybody. Vous merde sur moi, je chie sur vous! Then take the time to consider; very carefully, what is the reality behind the political bullsh*t we are subjected to.